Return Mail - What the heck happened? You’ve labeled and stamped your postcards and just dropped them off at the Post Office. You are excited for all these postcards to reach your potential customers. A few days later you get postcards back in the mail and you’re wondering what the heck happened? Why weren’t these delivered? Returns are every Direct Mail Marketers biggest frustration. But the fact is that returns are just a normal part of doing direct mail. According to the United States Postal Service, the industry standard for returns is 10%. We strive to beat this rate, but you should expect some returns from your mailings. Returns should be thought of as a normal expense of doing direct mail just like the cost of printing postcards or buying stamps. Focus on using the total cost of your mailing to figure out your cost per call or cost per booking. And, as long as these are meeting your budget targets then returns shouldn’t deter you from Direct Mail. Why does return mail happen? 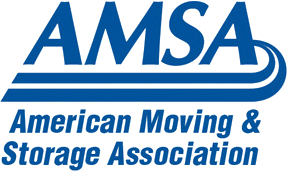 According to the USPS, only 50% of movers will complete a National Change of Address (NCOA) form. That means that of the 5 million household moves each year only 2.5 million of these homeowners will complete a form to update their status. Likewise, the USPS relies on their letter-carriers to actually notice when they are delivering mail if the home appears vacant. Carriers then complete a vacancy card that is submitted to the home post office. Those are eventually collected and added to the database by someone in the post office. Delays happen when the letter carrier does not complete the vacancy cards or they do not promptly update the database. It can take up to 90 days for the USPS to update their database with NCOA and vacancy information. How do we Minimize the Returns on our List? At Movingleads.com, we make the best effort to suppress bad data and eliminate returns. Every week, our lists are verified with the latest data. County Records to append a Homeowner name. This is when we eliminate second homes, new construction, rentals, and bank owned properties. CASS software to make sure all your leads are deliverable addresses so you will never be sold an address that is not valid. NOCA database for change of addresses and vacancies. We mail every postcard with first class postage, for quick delivery. Bottom Line: There is no perfect way to eliminate all vacancies and returns. Again, there can be a delay of up to 90 days before the Post Office updates their data. 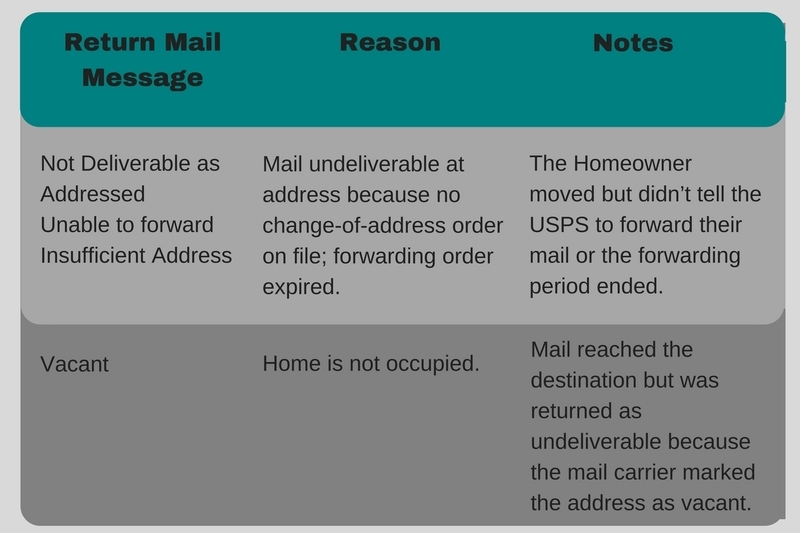 If the data isn't current, it is impossible for us to know prior to mailing if the postcard will be returned. Why did I get a large amount of returns in one day? Is this more than 10%? If you get a large amount of returns in just a day or two it can seem overwhelming and feel like you are exceeding 10%. 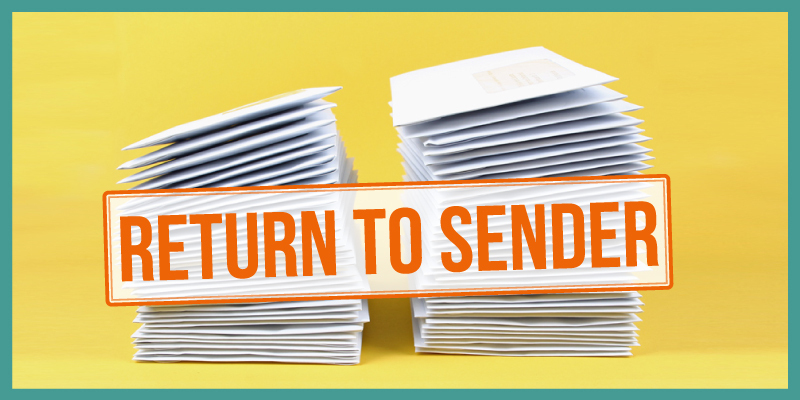 Bulk returns are usually an accumulation of the returns from 6-8 weeks of mailings. The Post Office will sometimes hold all returns and deliver all at once. You can check for the date stamp or look up address on the list sent in your weekly email to see the time period of your returns. If your return rate ever exceeds 10% of postcards mailed, that would be high and we will gladly research returns above this threshold. While Returns are a bummer, we hope you can see that we are working hard to make sure our list is the best it can be. We really do want you to have the cleanest list possible so your direct mail program is successful. Direct Mail & Automated Postcards Work! 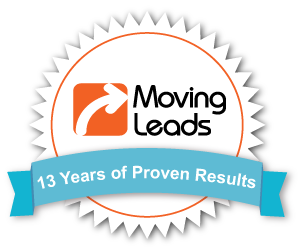 At MovingLeads.com, we have over 13 years of experience and happy customers. 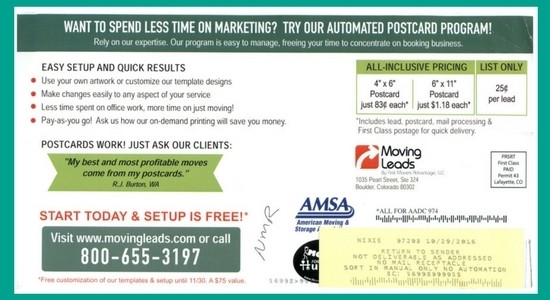 Getting started with automated postcards ensures a full pipeline of qualified moving leads throughout the year, and we do all the work! 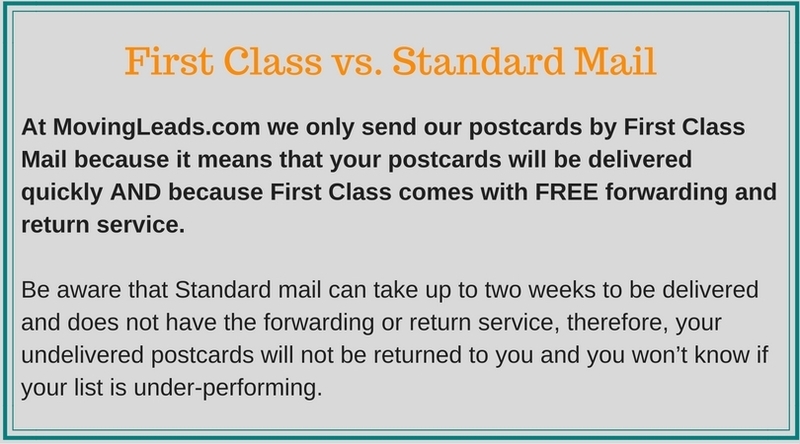 Click here to learn more about our automated postcard service. Ready to sign up? Call us at 303-443-0767.